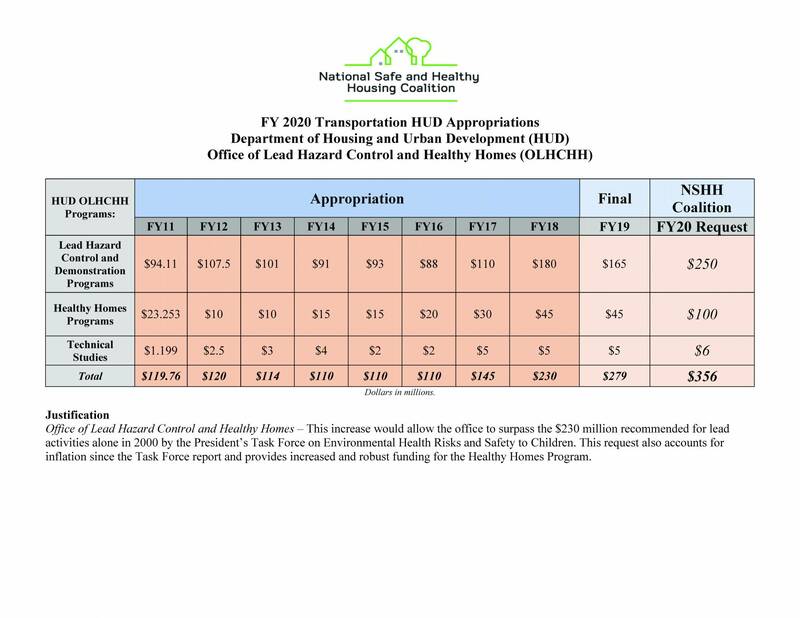 The tables below chart the recent funding history and the National Safe and Healthy Housing Coalition‘s (NSHHC) funding requests for key programs in lead poisoning prevention, asthma control, and healthy homes. NCHH is a proud member of the NSHHC. FY 2020 Appropriations: Click the links to view full-sized tables. Increasing the CDC Healthy Homes and Lead Poisoning Prevention program allows CDC to provide grants to conduct needed surveillance of children exposed to lead, provide national data on childhood lead poisoning, ensure that children receive necessary case management, and enable local jurisdictions to take action before children are exposed to lead instead of reacting only after they have been harmed. We support increased funding for this program at $50 million, which will allow for grants to all 50 states. CDC’s National Asthma Control program funds states, localities, and other organizations to improve asthma surveillance, awareness, and education. Since its inception, the program has supported asthma control programs in 34 states, the District of Columbia, and Puerto Rico; asthma death rates have decreased by 27%; and costs due to asthma illness and death have decreased by $23.1 billion. We support increased funding for this program at $34 million, which would allow for additional funding for state grants. CDC’s National Environmental Public Health Tracking Network supports environmental public health tracking and data networks in 25 states and one city. These program has 19 datasets, 96 indicators, and 379 health measures ranging from asthma to drinking water quality and carbon monoxide exposure. To date, state and local health officials have used the Tracking Network over 225 times to prevent sickness and death. We support increased funding for this program from $34 to $40 million, which would allow the program to fund three additional states. HUD’s Office of Lead Hazard Control and Healthy Homes has directly addressed lead and other health hazards over the last two decades through programs that treat individual units for lead hazards, improve lead safety with enforcement action and upgrade substandard housing with healthy homes improvements. We support increased funding for this program to at least $356 million, including $250 million for HUD’s Lead Paint program, $100 million for the Healthy Homes program, and $6 million for the Lead Technical Studies program.This increase would allow the office to surpass the $230 million recommended for lead activities alone in 2000 by the President’s Task Force on Environmental Health Risks and Safety to Children. This request also accounts for inflation since the Task Force report and provides increased and robust funding for the Healthy Homes Program. EPA’s Lead Categorical Grant and Lead Risk Reduction program are key to the nation’s work on childhood lead poisoning prevention. Through funding for states and EPA regional offices, these programs support science-based standards used to define what lead hazards are in order to protect pregnant women and vulnerable children; they require lead-safe work practices during renovation, repair, and painting (RRP) work; and they ensure that consumers seeking lead inspection, abatement, and risk assessment services can find qualified, trained individuals to perform the work properly. We support increased funding for these programs at $17 million each. As the CDC reference level for lead continues downward, communities will be looking at more children to protect and will require more resources to address the needs of lead poisoned children. EPA’s Radon Categorical Grant, Indoor Air: Radon, and Reduce Risk from Indoor Air programs work to protect residents from health risks associated with indoor air, including radon, which is found in basements and is the second leading cause of lung cancer in the U.S.; asthma triggers located in the home; and mold, which is a particular concern in the aftermath of flooding. We support increased funding for these programs at $17 million, $4 million, and $15 million, respectively. Poor indoor air quality remains an issue in the U.S. With outdoor air quality worsening in many parts of the country, it is imperative that we devote more resources to address and improve indoor air quality. In addition, awareness of radon as a public health issue has increased and so the demand for radon mitigation services is also expected to increase. EPA’s Children and Other Sensitive Populations: Agency Coordination effort ensures agency programs that protect children’s environmental health, including work on developing regulations, improving science policy, implementing programs at the community level, and measuring progress on children’s health. We support level-funding this program at $8 million. The incidence of asthma and a number of other chronic diseases is increasing nationwide; therefore, more resources are needed to address the needs of these sensitive populations. On April 18, the National Safe and Healthy Housing Coalition sent a pair of letters, signed by 14 organizations and 18 individuals, to the Senate Appropriations subcommittees on Transportation, Housing, and Urban Development (THUD) and Labor, Health, and Human Services (Labor-H). The letters echoed “Dear Colleague” letters circulated in the chamber and included the coalition’s funding requests for HUD and CDC programs. Read the THUD and Labor-H letters. In March 2018, following the Bipartisan Budget Act of 2018, Congress passed the Consolidated Appropriations Act of 2018, which includes significant increases for healthy homes programs, representing the hard work of healthy housing advocates and Hill allies over the past several years. Highlights of these victories include a record $230 million for HUD’s Office of Lead Hazard Control and Healthy Homes, an $85 million increase and including $45 million for healthy homes programs, and $35 million for CDC’s Childhood Lead Poisoning Prevention program, an $18 million increase and restoring the program to pre-2012 levels. Read more about how the omnibus bill supports healthy housing. November 2017: The National Safe and Healthy Housing Coalition sent a pair of letters to the House and Senate appropriations committees outlining the FY18 funding requests of $230 million for HUD’s program, $50 million for CDC’s lead program, $40 million for CDC’s environmental public health tracking, and level funding for the other programs on this page. May 2017: The President’s FY18 budget was released. While it requested level or slightly increased funding for HUD and CDC’s lead programs, it reduced funding for the National Asthma Control program and eliminated other programs vital to healthy housing efforts, including the Community Development Block Grant program and the HOME Investment Partnership program. More than 400 individuals and organizations signed letters to the House and Senate calling for preservation of these programs, as well as EPA’s lead programs, and significantly increased funding for HUD and CDC’s lead programs. These letters were drafted by the Environmental Defense Fund, Healthy Babies Bright Futures, the Green & Healthy Homes Initiative, the Lead and Environmental Hazards Association, and NCHH. May 2017: Twenty-one senators signed on to Senator Reed’s letter to Chairman Blunt and Ranking Member Murray of the Labor-HHS Appropriations Subcommittee in support of $35 million in funding for CDC’s Healthy Homes and Lead Poisoning Prevention program. April 2017: Following leaked internal memos that recommended the elimination of EPA’s two lead programs, over 500 organizations and individuals signed a letter, drafted by the Environmental Defense Fund, Healthy Babies Bright Futures, the Green & Healthy Homes Initiative, the Lead and Environmental Hazards Association, and NCHH, calling on EPA Administrator Scott Pruitt to preserve those programs. FY 2018 Appropriations: Click the links to view full-sized tables. In May 2017, Congress passed the final spending package for the remainder of FY17. 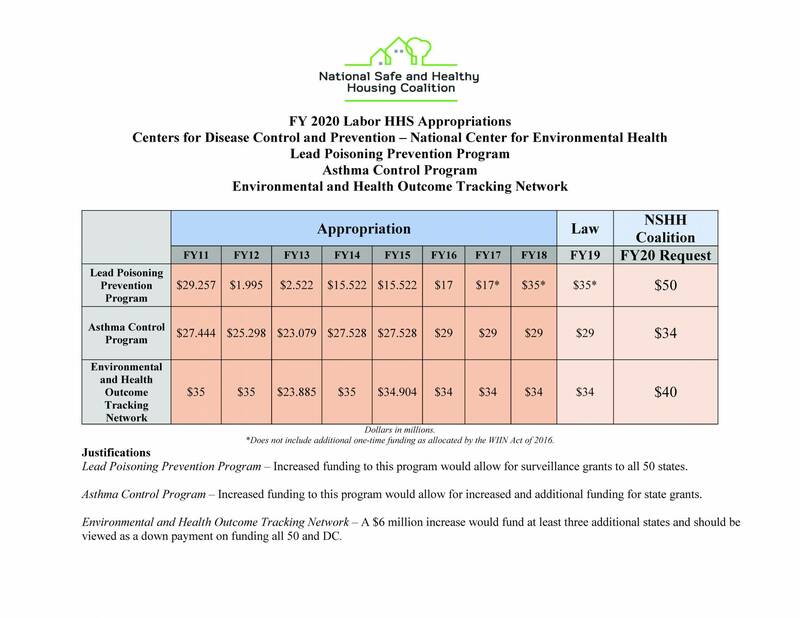 The Consolidated Appropriations Act of 2017 included $145 million for HUD’s Office of Lead Hazard Control and Healthy Homes, an increase of $35 million over the FY16 numbers, and level funding for CDC’s Healthy Homes and Lead Poisoning Prevention Program at $17 million. $15 million for the CDC’s Healthy Homes and Lead Poisoning Prevention program. 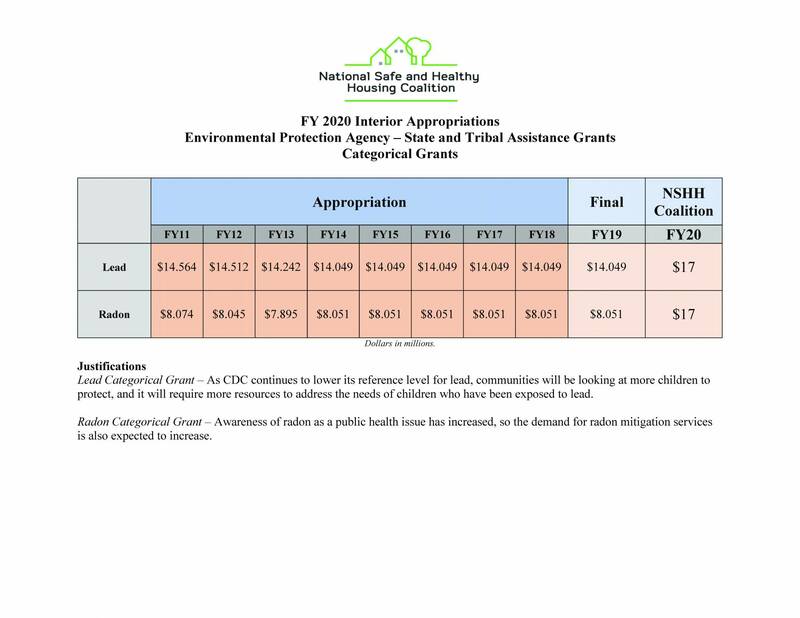 The NSHHC’s sign-on letter to Congress for federal lead poisoning prevention funding increases had over 140 signatures and was sent to over 200 Hill staff. Seventy-five representatives signed on to Representative Slaughter and Representative Cicilline’s letter to increase funding for lead poisoning prevention. Twenty-four senators signed on to Senator Reed’s and/or Senator Shaheen’s letters to increase funding for lead poisoning prevention. In December 2015, Congress and the president enacted the final spending package for FY16 (Consolidated Appropriations Act, 2016). 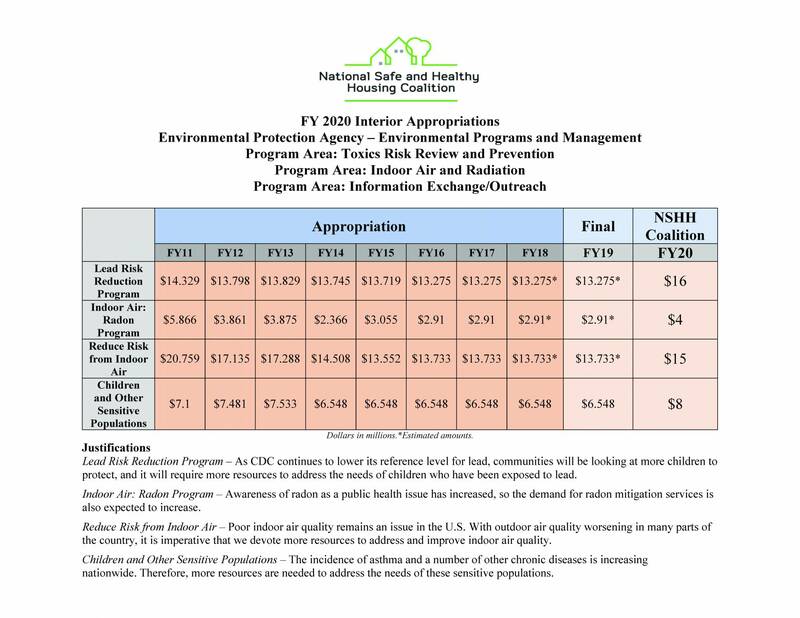 The omnibus provided level funding for HUD’s Office of Lead Hazard Control and Healthy Homes at $110 million in FY 2016, despite the House voting earlier this year to cut the budget by one third. The omnibus increased funding for CDC’s Healthy Homes and Lead Poisoning Prevention program by $1.5 million to $17 million, its highest level since 2012. While we had advocated for a restoration of the full pre-2012 level of $29 million, this was a great step in the right direction. The omnibus also increased funding for CDC’s Asthma Control Program, which the National Safe and Healthy Housing Coalition supports, by $1.5 million to $29 million. The bill’s report language called for HUD to implement a single inspection protocol for both public housing and Section 8 voucher (HCV) units. Previously, the housing quality standards were much higher for public housing so this benefited the residents of Section 8 voucher program. An earlier report called for HUD to report to Congress in 90 days on a plan for updating the HCV standards and its timeline for a single inspection protocol. Find more details on congressional action for healthy homes funding during the 2016 appropriations process here.